Jaguar’s epic 3.4 liter, DOHC inline-six powered D-Types were originally built for competitive racing. However, by 1957, the D-Type had become obsolete– new racing mandates now called for smaller 3.0-liter engines, which would hurt the D-Type’s performance on the track. By that time, Ferrari had proven to be the masters of small-displacement, high-performance racing, particularly with their iconic Testarossa that could metaphorically leave the Type’s 3.0 liter in the dust. Jaguar found itself needing to unload 25 of the 3.4 liter D-Types. Jaguar executives then decided to convert their old D-Types into street legal sports cars and sell them to the public as limited-edition GTs. 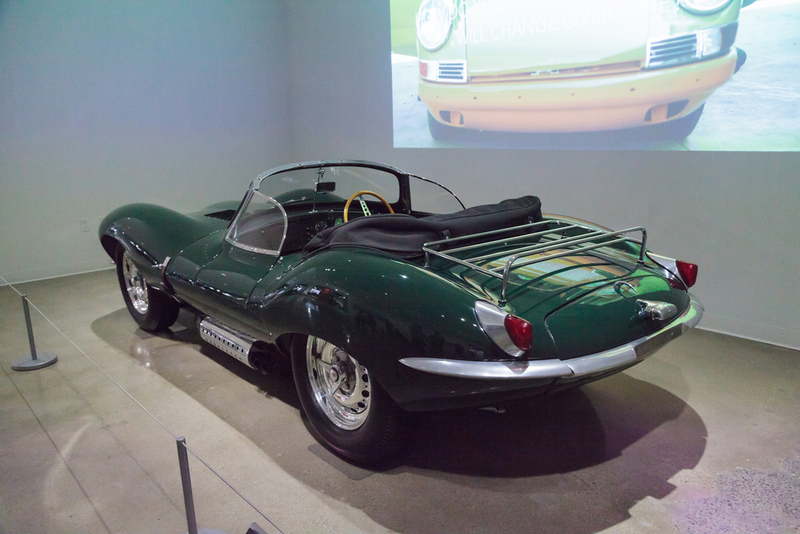 Jaguar was subjected to a series of street-legal retrofits, including– a full-width windshield, and a bare-bones top and luggage rack added to the rear deck replaced the original racing dorsal fin. Removable fixed-pane side curtains were then mounted to the Jaguar’s doors. A vestigial exhaust system was devised by engineers– complete with a guard to prevent laymen from burning themselves on the Jag’s exposed, aggressive sidepipes. The roadster’s lighting was converted to meet street specs, two nicely-appointed seats were added, a passenger side door and sleek bumpers were tacked-on, and they were ready to roll. Tragically, 9 of the 25 XK-SS D-Types were destroyed by a fire at the Jaguar factory in 1957, making the remaining 16 all the more special. Most of the surviving 16 XKSS were sold in the USA, with only 12 of which are known to still exist. Conceived as an road-going version of the Jaguar D-Type racing car. Actor and style icon Steve McQueen bought his for $5,000 way back in 1958 (about $40,000 if adjusted for 2015 inflation), and it’s estimated to be worth $30 million now. 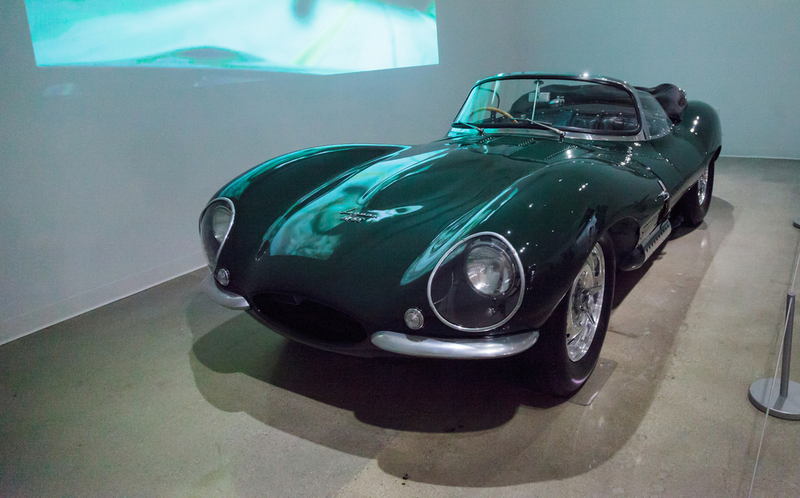 He bought this Jaguar XKSS from a local TV personality and became the third owner of XKSS chassis No. 713, a car that had originally been imported a year earlier by Jaguar North America. Jaguar built the XKSS as a way to use up leftover D-type chassis; the car had stopped racing in 1957, departing as an undisputed champion. Straight Le Mans victories in 1955, 1956 and 1957 cemented Jaguar’s reputation even as the company pulled out of factory efforts after the first year of winning. Lyons figured Americans loved fast European sports cars, so the Le Mans champion became a thinly veiled race car for the street: Off went that fabulous fin and on went a passenger door, chrome bumpers and a rudimentary top. For the most part, that was it. Following Jaguar’s withdrawal from competition at the end of the 1955 season, a number of completed and partially complete D-types remained unsold at the Browns Lane factory. In an attempt to recoup some of the investment made in building these unused chassis, and to exploit the lucrative American market for high-performance European sports cars, Sir William Lyons decided to convert a number to full road-going specification. Only minor changes were made to the basic D-type structure: the addition of a passenger side door, the removal of the large fin behind the driver’s seat, and the removal of the divider between passenger and driver seats. In addition, changes were made for cosmetic, comfort and legal reasons: a full-width, chrome-surrounded windscreen was added; sidescreens were added to both driver and passenger doors; a rudimentary, folding, fabric roof was added for weather protection; chromed bumpers were added front and rear (a styling cue later used on the E-type); XK140 rear light clusters mounted higher on the wings; and thin chrome strips added to the edge of the front light fairings. XKSS No. 713, McQueen’s model, was off-white with a red interior — a thoroughly handsome color scheme, especially for a convertible, but McQueen wouldn’t have any of it and off went the white, on went British Racing green and the red interior, was swapped for a black. Finally, McQueen modified the doors to open above the achingly tall doorsill, upwards and outwards like the Aston Martin DB9. Dana Williamson has been the Petersen Auto Museum manager and has been entrusted him with McQueen’s car having acquired the car from Richard Freshman. The collector purchased the car from the McQueen estate in 1984 as it was being liquidated. Freshman fought desperately to keep it in the family before seeking a sympathetic restoration in the Jaguar’s native England. The museum which the care resides exercises most of its cars once a month since seals dry up, plugs foul, oil sludges to the bottom. Approved officials do a few laps on the roof of the Petersen, often taking a few pictures since the permit to drive on the street is a hassle. The car, much like the Toyota 2000GT was also featured in Jay Leno’s Garage although the retired host does not have it in his possession. So there you have it, a classic car, a rare car from an era long past. It’s historical importance makes it an icon but also it’s marvelous engineering from Jaguar make it a classic. From its slick 2-door roadster body type, RWD (rear-wheel drive), manual 4-speed gearbox engine pumping out 262 hp , this was a car from the end of the 50s that could reach 0- 60 mph in 5.6 s at about 21.3 mpg which was then only reserved for professional auto racing. 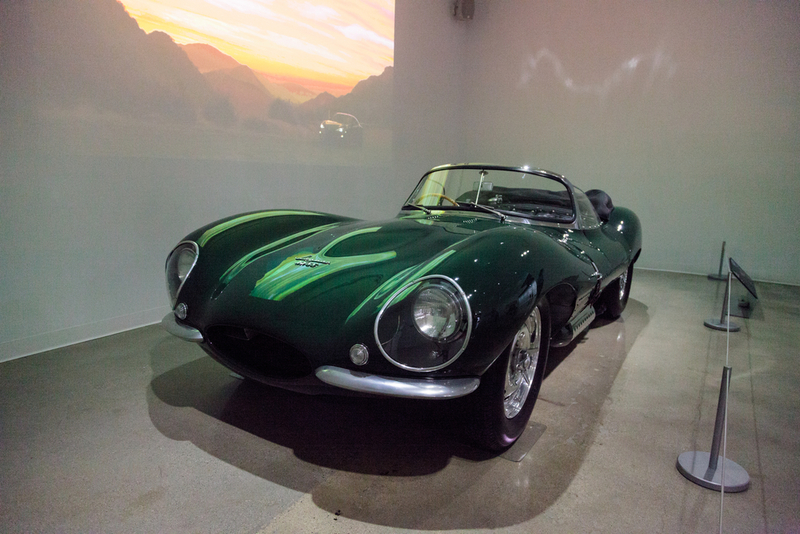 Though the vehicle was never made again, you can see ripples of influence down to Jaguar’s modern slate of vehicles.